A.P. Klimley and D.G. Ainley, White Shark Research in the Past: A Perspective. R.C. Murphy, A Plea for White Shark Conservation. G. Hubell, Using Tooth Structure to Determine the Evolutionary History of the White Shark. S.P. Applegate and L. Espinosa-Arrubarrena, The Fossil History of Carcharodon and Its Possible Ancestor, Cretolamna: A Study in Tooth Identification. D.J. Long and B.M. Waggoner, Evolutionary Relationships of the White Shark: A Phylogeny of Lamniform Sharks Based on Dental Morphology. A.P. Martin, Systematics of the Lamnidae and the Origination Time of Carcharodon carcharias Inferred from the Comparative Analysis of Mitochondrial DNA Sequences. M.D. Gottfried, L.J.V. Compagno, and S.C. Bowman, Size and Skeletal Anatomy of the Giant "Megatooth" Shark Carcharodon megalodon. R.W. Purdy, Paleoecology of Fossil White Sharks. H.F. Mollet and G.M. Cailliet, Using Allometry to Predict Body Mass from Linear Measurements of the White Shark. H.F. Mollet, G.M. Cailliet, A.P. Klimley, D.A. Ebert, A.D. Testi, and L.J.V. Compagno, A Review of Length Validation Methods and Protocols to Measure Large White Sharks. K.J. Goldman, S.D. Anderson, J.E. McCosker, and A.P. Klimley, Temperature, Swimming Depth, and Movements of a White Shark at the South Farallon Islands, California. L.S. Demski and R.Gl. Northcutt, The Brain and Cranial Nerves of the White Shark: An Evolutionary Perspective. H.L. Pratt, Jr., Reproduction in the Male White Shark. S. Uchida, M. Toda, K. Teshima, and K. Yano, Pregnant White Sharks with Full-Term Embryos from Japan. M.P. Francis, Observations on a Pregnant White Shark with a Review of Reproductive Biology. A.P. Klimley, P. Pyle, and S.D. Anderson, The Behavior of White Sharks and Their Pinniped Prey during Predatory Attacks. B.J. LeBoeuf and D.E. Crocker, Diving Behavior of Elephant Seals: Implications for Predator Avoidance. W.R. Strong, Jr., Repetitive Aerial Jaw Gaping: A Thwart-Induced Behavior in White Sharks. R.S. Collier, M. Marks, and R.W. Warner, White Shark Attacks on Inanimate Objects along the Pacific Coast of North America. S.D. Anderson, R.P. Henderson, P. Pyle, and D.G. Ainley, Observations of White Shark Reactions to Unbaited Decoys. W.R. Strong, Jr., Shape Discrimination and Visual Predatory Tactics in White Sharks. A.P. Klimley, P. Pyle, and S.D. Anderson, Tail Slap and Breach: Agonistic Displays among White Sharks? D.J. Long, K.D. Hanni, P. Pyle, J. Roletto, R.E. Jones, and R. Bandar, White Shark Predation on Four Pinniped Species in Central California Waters: Geographic and Temporal Patterns Inferred from Wounded Carcasses. S.D. Anderson, A.P. Klimley, P. Pyle, and R.P. Henderson, Tidal Height and White Shark Predation at the South Farallon Islands, California. P. Pyle, S.D. Anderson, A.P. Klimley, and R.P. 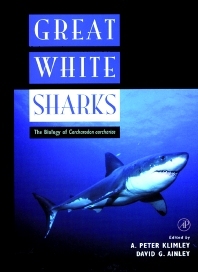 Henderson, Environmental Factors Affecting the Occurrence and Behavior of White Sharks at the Farallon Islands, California. D.J. Long and R.E. Jones, White Shark Predation and Scavenging on Cetaceans in the Eastern North Pacific Ocean. J.A. Ames, J.J. Geibel, F.E. Wendell, and C.A. Pattison, White Shark-Inflicted Wounds of Sea Otters in California, 1968-1992. D.J. Long, Records of White Shark-Bitten Leatherback Sea Turtles along the Central California Coast. I.K. Fergusson, Distribution and Autecology of the White Shark in the Eastern North Atlantic Ocean and the Mediterranean Sea. O.B.F. Gadig and R.S. Rosa, Occurrence of the White Shark along the Brazilian Coast. G. Cliff, S.F.J. Dudley, and M.R. Jury, Catches of White Sharks in KwaZulu-Natal, South Africa, and Environmental Influences. A.P. Klimley and S.D. Anderson, Residency Patterns of White Sharks at the South Farallon Islands, California. P. Pyle, S.D. Anderson, and D.G. Ainley, Trends in White Shark Predation at the South Farallon Islands, 1968-1993. C.A. Ferreira and T.P. Ferreira, Population Dynamics of White Sharks in South Africa. G. Cliff, R.P. Van Der Elst, A. Govender, T.K. Witthuhn, and E.M. Bullen, First Estimates of Mortality and Population Size on the South African Coast. W.R. Strong, Jr., B.D. Bruce, D.R. Nelson, and R.D. Murphy, Population Dynamics of White Sharks in Spencer Gulf, South Australia. G.M. Cailliet, An Evaluation of Methodologies to Study the Population Biology of White Sharks. J.E. McCosker and R.N. Lea, White Shark Attacks in the Eastern Pacific Ocean: An Update and Analysis. M. Levine, Unprovoked Attacks by White Sharks off the South African Coast. J. West, White Shark Attacks in Australian Waters. G.H. Burgess and M. Callahan, Worldwide Patterns of White Shark Attacks on Humans. D.R. Nelson and W.R. Strong, Jr., Chemical Repellent Tests on White Sharks, with Comments on Repellent Delivery Methods. H.D. Baldridge, Jr., Comments on Means for Avoidance or Deterrence of White Shark Attacks on Humans. B. Heneman and M. Glazer, More Rare Than Dangerous: A Case Study of White Shark Conservation in California. Bibliography. Subject Index. H.T. Harvey & Associates, Alviso, California, U.S.A.